Just the one season remains for Alejandro Hurtado at Celta Vigo as we complete the second year of the three year plan to win the Champions League. In our first year we got to the 1st Knockout Round of the Champions League but lost to Manchester United. In the league we finished 5th, a disappointing blow to our hopes of winning the biggest competition in Europe. This means for our second year of the 3 year plan we were left to play in the Europa League. Let’s take a look at how Celta Vigo progressed in the 2037/38 season. If Alejandro Hurtado and his team fail to qualify for the Champions League the dream is over! Alejandro Hurtado has undoubtedly had one of the greatest transfer windows of his managerial career. A big statement, but one that cannot be questioned having brought in five first team regulars for just over £13M. Rade Vazura was released from OGC Nice at the end of the 36/37 season and Alejandro Hurtado was quick to snap him up for Vigo. 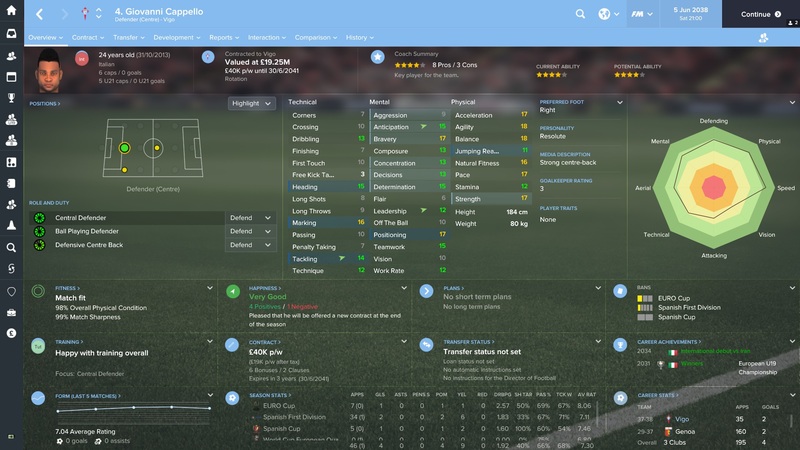 The centre-back has formed a solid partnership with fellow free transfer Giovanni Cappello. Giovanni Cappello was signed on a free after being released from Genoa. The Italian is a strong centre-back and has become an important member of Vigo’s first team. Eskild Rov came in for just £23K from Norweigen club Molde. He is already classed as a wonderkid and played a big role in the first team squad this year. Jeffrey van Eck is a well-rounded forward who came in from Dutch club PSV. His excellent dribbling, technique and flair allows him to offer something different in attack should we require some extra creativity. Emanuel Casaca came in as a direct replacement for Boris Poldrugac, again signed on a free. Having sold Poldrugac for £15M to Chelsea it is clear that Casaca is not only a great deal financially but also an improvement in quality. With just 1 win from our opening 7 league matches Alejandro Hurtado no doubt feared another disappointing season. But with the new players bedding in, and various changes made to the tactic, we have pulled it back to enter the winter break still within touching distance of the top four. Celta Vigo have settled on playing an attacking formation and tactic, allowing their strikers more opportunities to stick the ball in the back of the net. Celta Vigo negotiated their Europa League group successfully, winning five of their six games. In those six matches Vigo scored 28 goals, just under 5 per game. Although our attacking tactic is deadly offensively, we do seem to leak too many goals at the back. This is in part due to the tactic but also as a result of our poor goalkeeper. We desperately need to improve our man between the sticks if we want to challenge for continental success. 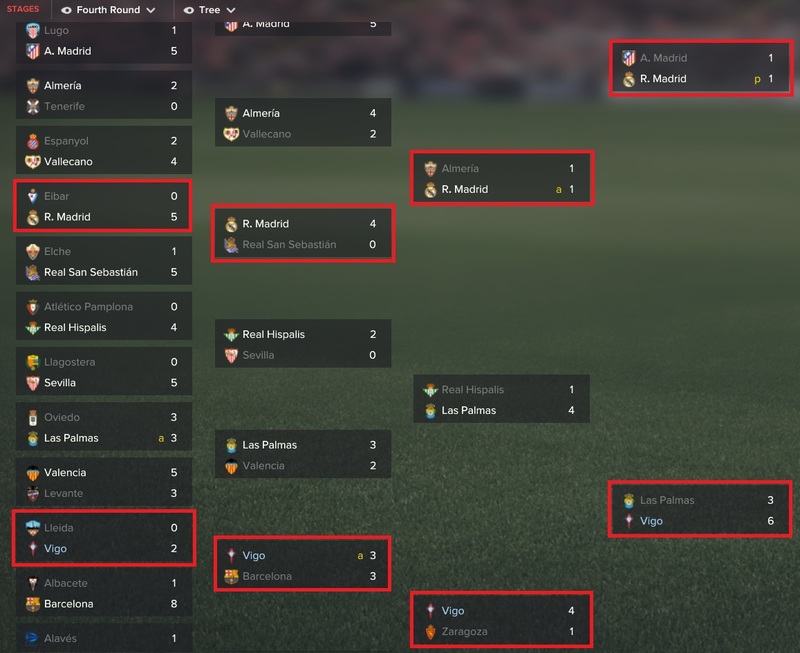 We have progressed to our second Copa del Rey final with Celta Vigo. Alejandro Hurtado’s side will meet Real Madrid in the end of season spectacle. Gutted. 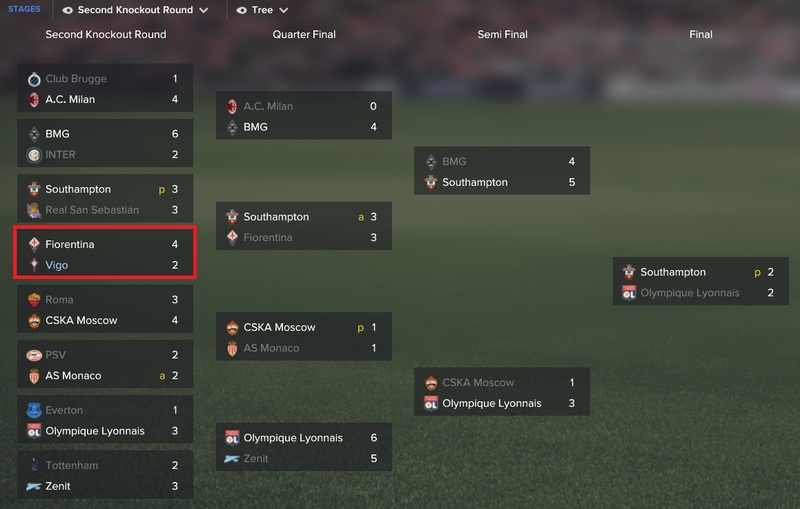 After beating Krasnodar in the 1st knockout round we faced Italian side Fiorentina. And lost 4-2 over two legs. The obvious goal was to challenge for the Europa League title in preparation for our Champions League push next year. So to exit in this way is a huge setback. 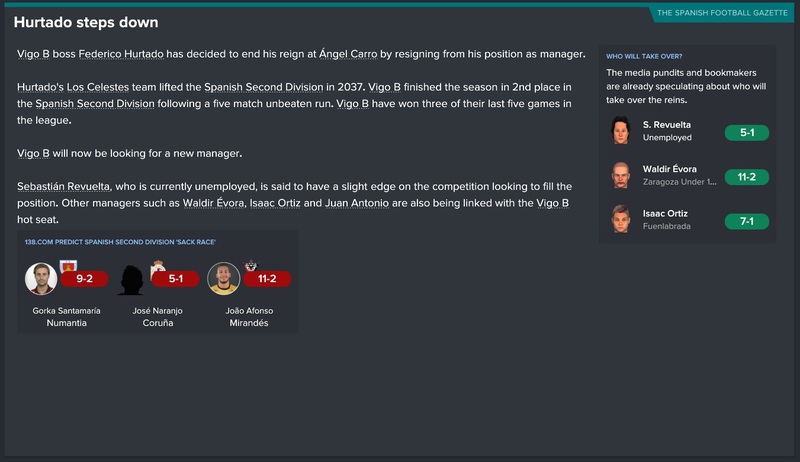 Finally Celta Vigo have ended a season with incredible form. Usually around this time of year we stutter and fall away. But 11 wins from the final 13 league matches saw us rise up the table to finish in 4th with 72 points, our best haul as Celta Vigo boss. Real Madrid prove too strong for Galician outfit Celta de Vigo. A 2-0 defeat ends the season on a sour note despite the progress seen in league form. It is safe to say that the 37/38 season could have gone better for Vigo, but the consistency of the formation allows us to move into next season with no doubts over the way we play. Angel Fabello is our main attacking midfielder moving forward. From our tactic you will have seen that we employ our attacking mid as a trequartista and Fabello has performed well in this role. Hugo Duarte joined us as a Vigo B player with potential at the beginning of last year. However he has developed incredibly well and is now first choice as our box-to-box midfielder with his very well-rounded stats. French striker Junior Makengo has lead the line for Vigo, alongside Hugo Santiago, for several years and will do so for many more to come. He contributed 21 goals in the season just gone. Lubos Ulrich, capped 37 times by Slovakia, is one of the main central midfielders in our squad. His high determination allows him to fight when the team is in trouble and inspire his teammates to do the same. The star of the series perhaps? Hugo Santiago has had his best season in a Vigo shirt so far, scoring 32 goals. He is crucial to the success of the team as we progress into our final year with Vigo. Despite another good finish in the second tier of Spain, Federico Hurtado has decided to leave his post as manager. The young manager, son of Alejandro Hurtado, has moved back to England with plans of becoming the manager of a lower tier club. Though his passion for football is at an all time high, Federico has stated that he is willing to wait for the perfect opportunity to re-enter management and won’t just jump in at the first opportunity. With Alejandro Hurtado looking set to resign from Vigo at the end of next season, what does the future hold for the popular father and son? Thanks for reading the latest instalment of VivaGlobetrotting. The final part of the series, part 50, will focus on our last attempt of winning the Champions League with Celta Vigo. Where do you think we need to improve in order to do so? If you enjoyed the post, please share on social media and feel free to get in touch with me through the links above. This entry was posted in FM17 Stories, Football Manager 2017, VivaG Spain, VivaGlobetrotting and tagged alejandro hurtado, celta vigo, copa del rey, europa league, europe, federico hurtado, fm stories, fm17, football manager, la liga, VivaG Spain. Bookmark the permalink.